Cats make fine pets but do you know why your cat has been scratching so much? If you look closely, you might be able to spot small insects moving around in cat hair. These are blood sucking insects most commonly known as cat fleas. You are probably wondering how you missed out on this information! The truth is that most cat and dog owners are not aware of the fleas till the scratching begins! Then the mad rush begins trying to understand how severe the condition is and does your cat or dog need medical intervention. Cat fleas can be quite an annoying condition for your pet and the good news is that in the last decade or so, a variety of Best flea medicine for cats available in the market. Now, your cat can be flea free! So, what are the solutions? In order to know how different flea removal solutions work, it is important to understand what cat fleas really is and how it affects your cat. The cat flea is known as Ctenocephalides felis and this small blood sucking insect belongs to the Siphonaptera order. The adult fleas vary in length from 1–2 mm and are normally reddish-brown in colour. It is one of the most widespread species of fleas on the planet. The reason for their near invisibility is because they are compressed laterally and this makes them extremely thin and hard to find in a cat's fur coat. The primary host for this blood sucking insects is the domestic cat but insufficient food or unavailability of the food source can lead them to bite humans especially on the lower legs. Cat flea infestations can also be seen in dogs. The cat flea goes through four stages during their life cycle and this includes egg, larva, pupa, and adult (imago). The female cat flea has to feed on blood to be able to reproduce. The fearful aspect is that they not only weaken cats and dogs by feeding on their blood but are also active disease vectors. Cat fleas are capable of transmitting different parasites as well as infections to cats, dogs and humans as well. The most common parasites or diseases include the Bartonella henselae (causes cat scratching disease), murine typhus, and apedermatitis. How do you know your cat is a victim of cat flea infestation? Most common symptoms include biting, itching, and scratching, around the ears, neck, and the base of their tail. Cats may develop signs of crusting along their back as they are sensitive to the saliva released during a flea bite. If you are lucky, you will be able to spot flea droppings and eggs in cat bedding. 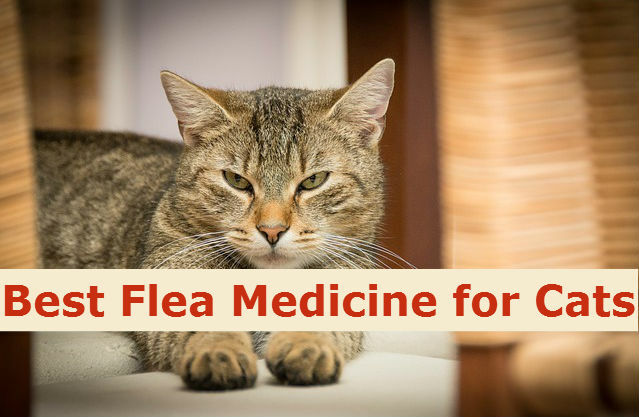 The first available medicine in the list of the best medicine flea for cats is the flea and tick treatment in cats is the use of flea and tick pills. Pills are considered as one of best methods of Oral flea protection. Since female fleas can lay anywhere from 50 eggs a day to 500 eggs in their lifetime, oral protections can provide the almost immediate effect. This tablet is considered one of the best flea medicine for cats that acts as one of the flea killers available out there. 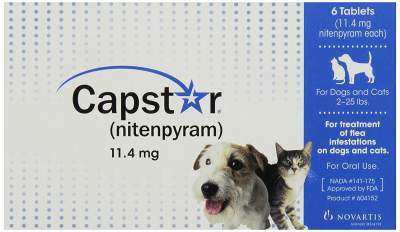 The active ingredient in Capstar is Nitenpyram, which belongs to the neonicotinoids class of chemicals. It attacks the nerve transmission system in fleas and kills them within 30 minutes from administration. 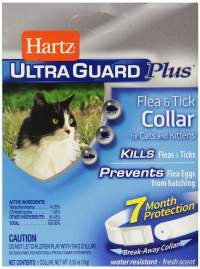 Medication: This type of collar applies medication or topical cream or oil to the cat's skin and this helps in killing fleas on contact. 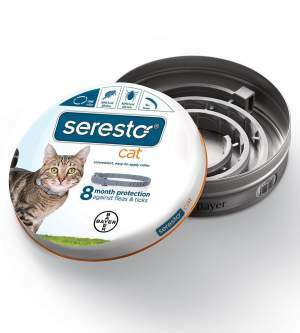 Seresto flea collar is an innovative flea collar created specifically for cats. The active ingredients include acaricide (kills ticks), insecticide Imidacloprid, and Flumethrin. The collar can fit 15" and has been designed to protect almost any breed and size of cat. This is an effective product from Hartz that comes with a utility time frame of 7 months. The collar not only kills fleas but also ticks and flea eggs. The active ingredient includes Tetrachlorovinphos (organophosphate pesticide) and S-Methoprene (insect growth regulator). Vet's Best® Waterless Cat Bath: It is an organic waterless shampoo that contains moisturiser, which is good for cat skin and coat. The ingredients of bath foam include neem oil, aloe vera, Vitamin E, and oatmeal. Flea Shampoo bar is meant for cats that have infestations that are deep within their coat and not merely on the surface. It is like a normal shampoo or soap bar that can kill or repel fleas and ticks. It is an eco-fiendly shampoo bar that creates a rich lather, which soothes the skin and leaves a refreshing scent. It is available in two different primary ingredients - citronella & geranium and contains organic neem oil, neem leaf extract, and aloe vera for killing fleas and ticks. A cat flea comb is another highly effective tool for cats with a smaller flea infestation. These combs can be used for cleaning their hair every day or specifically after the bath. Safari Flea Comb: This is an innovative product that comes with the double row of teeth. It can effectively remove fleas and ticks, flea eggs, larva and dirt. Gmilk Cat Flea Comb: This is a multipurpose comb that can effectively remove fleas, ticks, flea eggs, nit, and lice. This is one of the top products available in the market. This spray is meant for treatment of pet environment and effectively kills fleas and their eggs, ticks, as well as mosquitoes. The primary ingredients include clove oil and peppermint oil extract. This spray bottle comes with a trigger sprayer and can effectively kill adult fleas as well as their eggs and larvae. It is known to break the lifecycle of fleas by almost 2 months. Flea drops are most commonly known as spot-on and they are considered as one of the preferred treatments for cat owners. Normally, flea drops contain insecticides, which are effective in killing fleas on contact. This is a flea and tick control drop meant for cats and kittens. 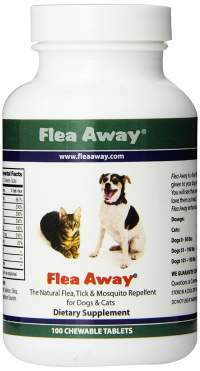 It is highly effective against fleas, flea eggs and larvae, chewing lice, and ticks. The active ingredients include fipronil and (S)-methoprene and a single dose can provide protection for almost 30 days. As the name suggests, a flea repellent is used specifically for repelling fleas or ticks. This can be used in your cat's immediate environment so that they don't become victims of flea or tick infestation. Flea Repellents for cats are extremely important flea medicine for cats as they repel those nasty fleas away from your cats. This is a 2-in-1 spray for cats and dogs that naturally repels fleas, ticks, chiggers, and mosquitoes and also eliminates any odor in your pet's environment. The active ingredients are organic and include therapeutic-grade citronella and lemongrass. This is a flea repellent made using natural or organic ingredients and works well for both cats and dogs. It can repel fleas, ticks, as well as mosquitoes. It is available in the form of chewable tablets. 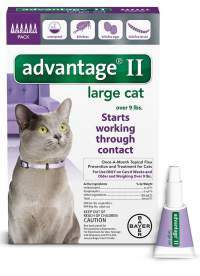 This is a highly effective flea control topical solution for cats. It can kill fleas within 12 hours of application. The active ingredients include imidacloprid (adulticide) and pyriproxyfen (insect growth regulator). It also targets the flea life cycle and effectively terminates re-infesting fleas as well. 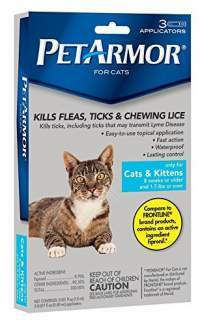 petarmoroffers protection to cats from flea and tick infestation. It has been created to terminate a variety of ticks including brown dog ticks and American dog ticks. This is a topical application that is fast acting with Fipronil being the active ingredient. 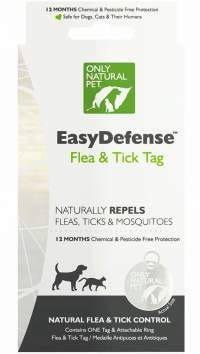 This flea tag is meant for both cats and dogs and doesn't contain any toxic chemicals or insecticide. It uses the pet's bio-energy for creating a natural preventative screen that deters flea, ticks, and other biting insects for a period of one year. The above are the best flea medicine for cats. Although, There are a variety of flea medicines or treatments available for cats and what you plan to use will depend on the type of infestation, and the existing medical and physical condition of your cat. 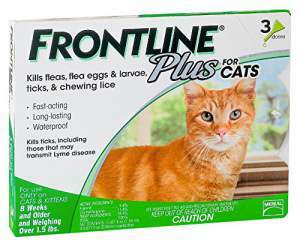 At the end of the day, it is important to use a product that will not be toxic for your cat and will also provide protection and relief from fleas. Very useful pest control niche blog ! !